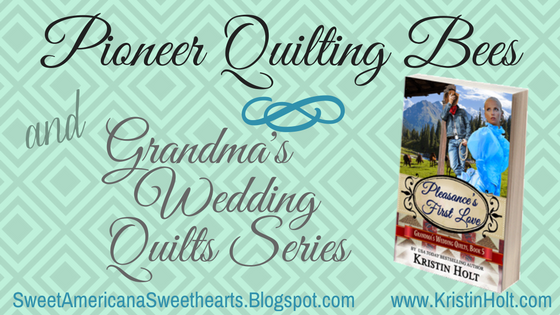 In preparation to write my upcoming new release, Pleasance's First Love, I came across a treasure--a book that covers quilting and quilting history, with glossy pages filled with photographs and original-sources--in my chosen location of Colorado! What I discovered within The Quilt That Walked to Golden stoked my imagination and helped me come up with historically accurate, fresh ideas that would fuel my plotting of this novella. 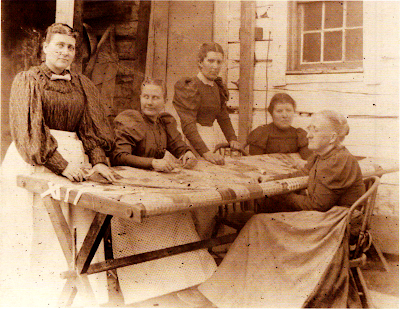 Women quilted alone, but with more leisure time and better transportation, they came together for afternoons of sewing. Quilting bees "were a purely American social custom, unknown in foreign countries," according to historian William Rush Dunton, Jr., author of the classic, Old Quilts... [Women] joined quilting bees because they wanted to socialize and enjoy themselves--and to show off their sewing as well as their culinary skills. "Our readers must not think that these feminine pastimes are a thing of the past. The old custom, hallowed by fond memories[,] is still observed: and Saturday Mrs. H.L. 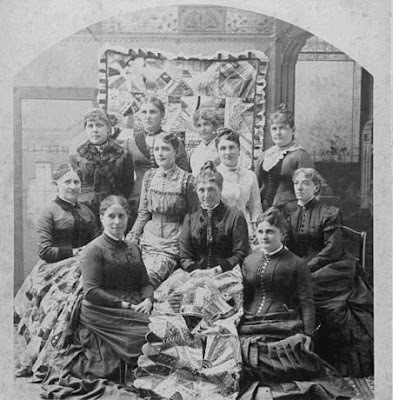 Wyman entertained a number of her lady friends with an old fashioned quilting bee," The Greely Tribune reported on March 9, 1893. "Ten pairs of deft hands aided the hostess in evolving a pattern that would have gained the approval of a Puritan matron and on the conclusion of the labor the mystic eleven sat down to a table loaded with good things gotten up for the comfort of the inner woman." "Quilt-making was a social event that my mother looked forward to with pleasure," recalled Hazel Dalziel, whose family lived near Longmont. "...A quilting bee gave women a chance to get together in the home of one of the group and talk, perhaps to gossip. It was a friendly and relaxed atmosphere , and the women were making something of which they were proud. It was a vacation from the long workdays." Introducing Sweet Americana Sweethearts' Authors' New Series, Grandma Mary's Wedding Quilts. 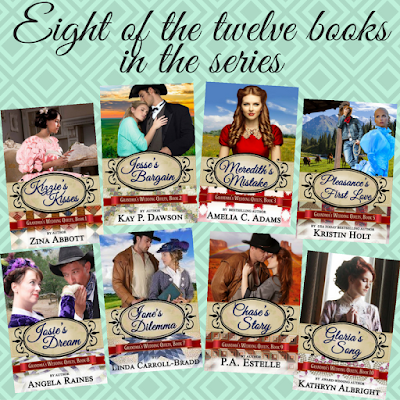 Twelve Titles, including a Prequel. 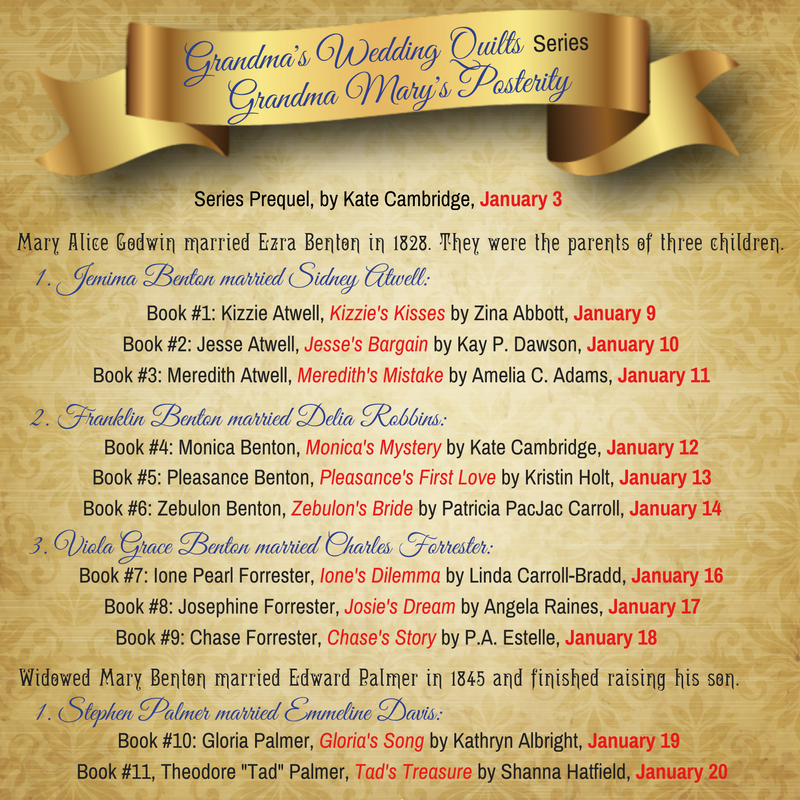 All stories are connected by family ties--all main characters are grandchildren of Grandma Mary, who ensured each of her grandchildren received a quilt from her on the occasion of their weddings. 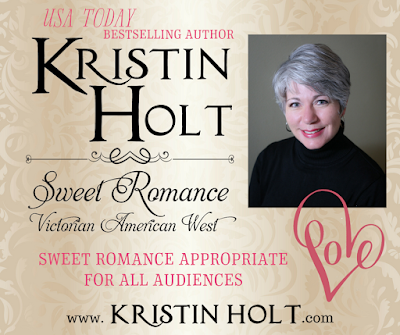 All novellas are Sweet, Clean reads, and all set in historic Americana--and all are as unique as their characters. 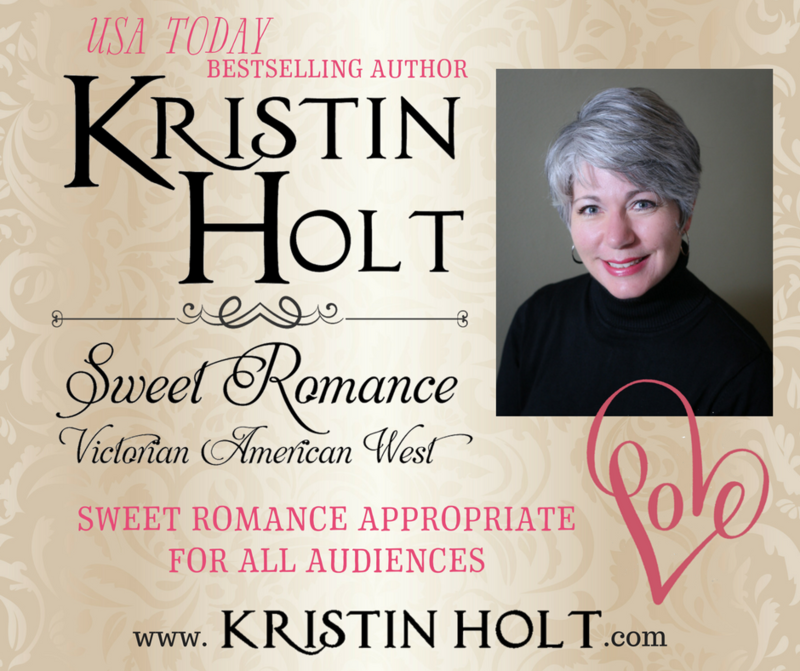 Brought to you by USA Today Bestselling, Award-winning, and Bestselling Authors who contribute to Sweet Americana Sweethearts. Look for this new series to debut in January 2017. Titles will be available on preorder later in December and release beginning January 3rd, 2017. See release schedule, below. Cover Artwork by Shanna Hatfield. 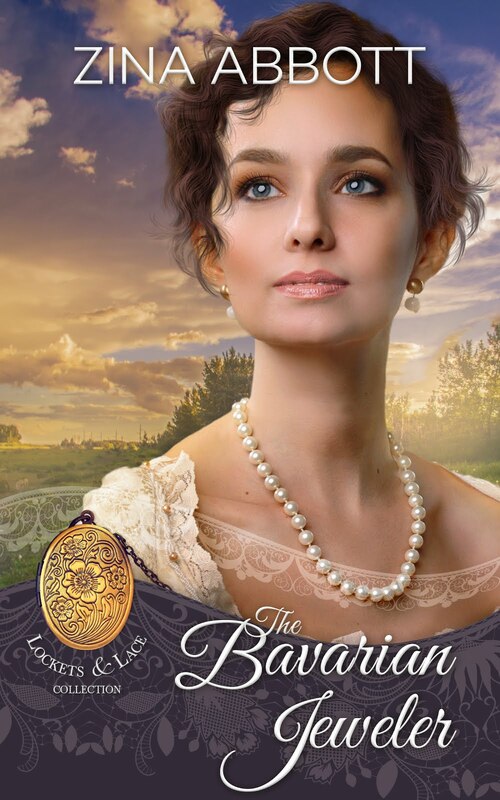 My title, Pleasance's First Love, is book #5 in the series, and will release on January 13, 2017. We'll see her family gather to quilt together the top (pattern: Flying Geese)--a gift from Grandma Mary, and the bottom which Pleasance pieced together over her courtship with Jacob Gideon, and the astounding surprises that come to light when they're put together on the quilting frames. Congrats on the new series!! 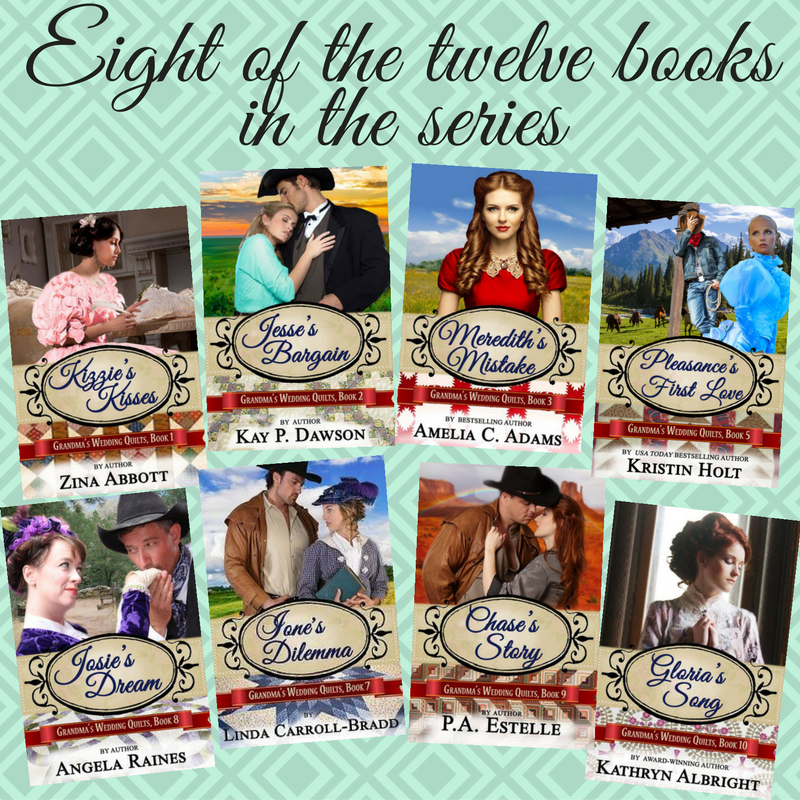 It's a great storyline that will be fun to read! Thank you so much, Linda. We're excited! Your posts are always so entertaining and informative. Grandma Mary did have some terrific grandkids!!! Great post and beginning, Kristin!